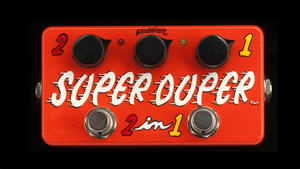 KitMonsters – ZVEX Super Duper 2 in 1. The music makers’ guide to making music. The ZVEX Super Duper 2-IN-1 gives you plenty of crunch with its two Super Hard Ons in one pedal - the SHOs serving up an ultra-transparent boost that goes from unity gain to a huge 60 times the original size, yet with high-end clarity with its 5 million ohm input impedance. That combination gives you any amount of gain for overdrive and distortion at any volume of input. You can get warm bluesiness through to a blast of rock goodness. ZVEX pedals are hand painted and unique, have a lifetime warranty, and you can even get custom artwork done.